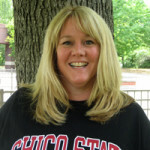 Kim Jaxon is an assistant professor of English (Composition & Literacy) at California State University, Chico. She received her Ph.D. at UC, Berkeley in the Language & Literacy, Society & Culture program in the Graduate School of Education. Her research interests focus on theories of literacy, particularly digital literacies, participation, classroom design, game theories, and teacher education. In her research and teaching, she uses a variety of digital platforms and considers the affordances in terms of student learning and participation. She has published a variety of book chapters and articles focused on classroom design, mentoring, and the uses of digital tools.